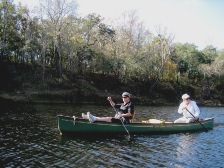 Mayo, FL--The Fellow Travelers were once again blessed with great weather for the annual Thanksgiving weekend paddle. 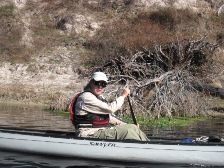 The destination was one paddled several times before but it was again a delightful trip. 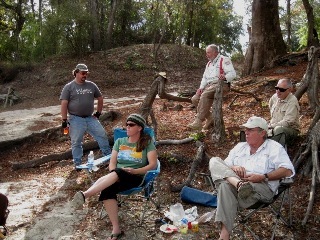 The group met for the launch on November 26, 2011, at the landing on Florida SR 250 at Dowling Park. Roy Moye brought his crowd--himself, Dave, Eric, Jacob, Sarah, Kaitlyn, and Gabriel. It was the first trip for Gabriel. John Williams brought daughter Leigh Anne. Art and Janice Shelfer came from Tallahassee. Greg Baker was staying at his estate on the Suwannee, Riversong, and came along for Friday’s paddle. Paul Tolar, Diane S tines along with doggie Ami, and Charlie Stines came down from Moultrie. No one was late. The weather was really warm considering that it was late November. The drivers shuttled the vehicles down to the camp sites at Lafayette Blue Springs State Park. Charlie had reserved the pavillion and had agreed to pay for it, but the very nice camp host refused the money and wished everyone a good time with free use of the shelter. Once the drivers returned, the paddlers loaded into the canoes and began the trip downriver. North Florida does not rival the Appalachian mountains for fall color, but 2011 was about as colorful an autumn as ever comes to the region. The scenery from Dowling Park to Luraville is mixed. Some of the banks are the pretty limestone formations resembling Swiss cheese or deep caverns while some of the banks are sloping grades covered with trees. The trees range from large cypresses and pines to sweet gums, maples, and saw palmettos. There are very few sandbars on this stretch of the Suwannee so primitive campsites are scarce. Wildlife is seldom spectacular on the Suwannee. No deer and no alligators were observed on the Friday paddle, but there were some ducks, hawks, and herons. A few turtles sunned themselves on the logs. The first stop was at Sims Landing. The landing is on the west bank and has a large grassy area with huge oak trees. It provided a good resting place. The canoeists did not actually eat lunch at Sims but did eat fruit and candy. Ami (Diane’s Yorkie) entertained the children. After a fairly long break, the canoes were reloaded and the second leg of the trip began. It was much like the first--very pleasant, very pretty scenery, low water, blue sky, but little to cause excitement. There are times when quiet pleasure tr umps excitement. The next stop was at Ezell Landing. This landing is sometimes used by the Fellow Travelers as a launch site, and it is also a place with a grassy area and pretty hardwoods. Charles Spring is almost directly across on the east bank of the river. The spring was very low and it was not possible to paddle up the spring run, but several of the adventurers did walk to the area and saw the beautiful blue color of the water. There were a few people picnicking there. After lunching at Ezell, the paddle to the state park began. The spring run from Allen Millpond was flowing strongly into the river but the water was much too shallow to allow canoeing to the spring. The group reached the state park in early afternoon and set up camp. The campers sat around and shared stories for a spell, and then it became time to cook supper. Mike and Haley Spiers arrived around dark, and they brought Miley and Michaela with them. Michaela was only two and a half years old and she broke the record as the youngest Fellow Traveler camper. (The record had been held by Byron Webb since he was three, and now Byron is a Clemson graduate and an electrical engineer. Maybe Michaela can hold the record fo r twenty years.) Donald May also came down for the camping. Charlie cooked chili for supper. There were some desserts, too. There was Dutch over pineapple upside-down cake, blackberry cobbler, brownies, and other goodies. After the dishes were washed most of the group went to John’s campsite and enjoyed the fire. Eventually, the group ran out of stories and went to bed. No one was up before daylight. The King made an urn of coffee and Roy, Greg, and Art prepared a huge breakfast of pancakes, grits, eg gs, sausage, biscuits, and bacon. Greg elected not to paddle on Saturday but he did shuttle the drivers to the take-out at the SR 51 bridge at Luraville. The Saturday paddle began when the drivers returned to the state park. 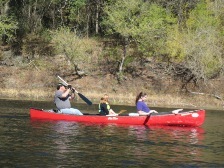 Mike and Haley took both daughters and joined the paddlers who had made the Friday trip. The group stopped briefly on the bank before reaching Perry Spring and then stopped again at the spring. The small shoal above the Hal Adams bridge gave the canoeists a chance to feel a little speedy water, but once that was accomplished it was time to paddle under the bridge and take out at the boat ramp. It was another good trip.